RC21 Conference 2017: Call for Sessions! We live in an increasingly urban, globalised and unequal world facing multiple crises: from financial and political to infrastructural and ecological. In this context, cities have become both the locus of economic growth and development, and the principle site of social conflict and political contestation over spatial inequalities, belonging, environment and sustainability. Yet many of the forms these dynamics and contestations take are captured only partially or inadequately in both conventional mainstream and radical urban theory. 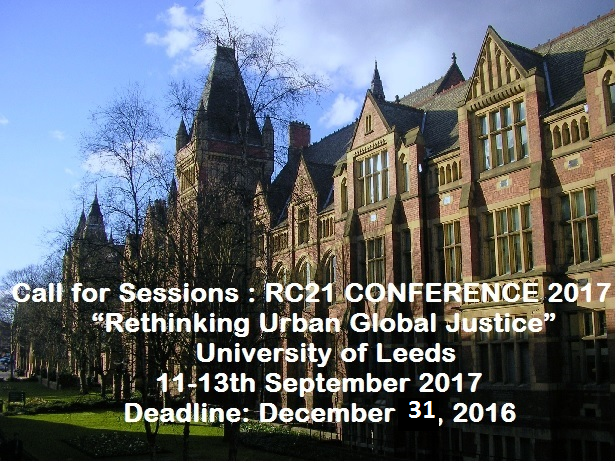 Drawing on past RC21 conference themes, we want to call attention on ‘global urban justice’ as a term to focus our scholarship and research impact on society. GLOBAL: Our world is at the same time global and also rooted in particular places. Migration and refugee flows, global terrorism, climate change, financial capital, social media are all stretched out and expanding as well locked-in particular spatial arrangements mediated through uneven power geometries. How can urban studies capture the multiplicity and simultaneity of global and territorially embedded processes? Which theoretical progress may expand the learning on global urban developments and further de-colonise knowledge production? What methodological advances are best suited for this theoretical endeavour? URBAN: The urban condition is not contained in cities; it overspills into rural or cybernetic spaces, and it is increasingly mediated through physical and virtual infrastructures. Urban studies have the advantage of bringing together a multitude of disciplines, but how can different theoretical corpus and methodological traditions effectively communicate with each other, thus providing a better understanding for urban studies? Which are the key challenges of the contemporary urban condition and how do they advance paradigmatic transdisciplinary shifts? JUSTICE: A multitude of calls for justice are being orchestrated by movements and grassroots groups from cities: against displacement and eviction, racism, police violence, climate change and lack of urban democracy. At the same time people are coming up with their solutions from Rojava’s experimental democracy, grassroots solidarity for refugees and migrants, self-built and cooperative housing, reclamation and self-management of food, water, energy and land in cities. How can urban scholarship engage with these struggles in a novel way and co-produce emancipator knowledge in and beyond the academy? Which new insights can we gain from the multiplicity of social struggles taking place around the Globe? What is the role of the state in creating and/or solving these injustices and how can urban scholars engage in policy making? We welcome a variety of types of sessions: from the more traditional format with around four papers in a two hour session to dynamic workshops, roundtables and sessions with audio-visual material. When you send your sessions proposal indicate clearly what type of session you are planning indicating its length and format. Session convenors are responsible for one or more slots (the total number of slots will depend on the number of abstracts submitted at a later stage). Convenors will participate in the process of abstract selection for their sessions and the exact process for this will be discussed with the local organising team. Convenors chair their respective session(s). Convenors should not submit abstracts to their own sessions. • A 300 word short description of the topic, including a description of the format, type and expected length of the session. The content of the session should reflect links to the conference theme. • Full contact details of the session convenor(s) (with a maximum of two convenors per session): Name, affiliation, postal address, phone number and email. Scholars at Leeds University are at the forefront of rethinking these core and emerging urban studies themes, developing counter-disciplinary thinking across a porous range of topics extending beyond traditional boundaries and working beyond the academy. These qualities are being now put together into an innovative forthcoming MSc programme on Future Cities that speaks to the heart of RC21’s mission. Bringing this potential together, the conference is organised by scholars at the Geography, Sociology and Social Policy departments supported by a new University of Leeds cross-faculty initiative “CITIES”, (with substantial presence in engineering and economics faculties) and the Leeds Social Science Institute. The quintessentially Northern post-industrial city region of Leeds provides a compelling “critical space” for reimagining urban justice within these themes, in a call for work that goes beyond description of urban problems to look at innovative initiatives from social movements, grassroots activists and public/private policy institutions and organisations alike. Its paradigmatic local histories of social decline, unrest, opposition and violence, need contrasting with its recent rebranding as a “powerhouse” with which a distant government seeks to redefine and reinsert the city in global flows.